An overwhelming number of Northerners broke through the Confederates' line. 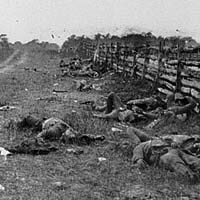 Union bullets rained down the lane onto Confederate soldiers, and the former Sunken Road came to be known as Bloody Lane because of the tragic death toll suffered there. Covered by cannon fire from General Stonewall Jackson's artillery, the Southerners retreated toward Sharpsburg, while the Union troops fell back. New Southern troops arrived in time to repel a second Union attack led by General Ambrose Burnside. By nightfall, the Confederates occupied the town of Sharpsburg, but the battle was a Union victory. More than 23,000 men were killed, wounded, or missing in action. The next day, Lee began his retreat across the Potomac River. Lee's plan to find new recruits and supplies in Maryland, a slave-holding state that remained in the Union, had failed. The next year he would launch another assault into Union territory, which came to a head at the 1863 Battle of Gettysburg in Pennsylvania.